When Mr Archimedes takes a bath with three of his friends, Kangaroo, Wombat and Goat, the water always overflows and makes a mess. Mr Archimedes is determined to find the culprit. Using a measure and taking turns getting out, they finally discover who it is. 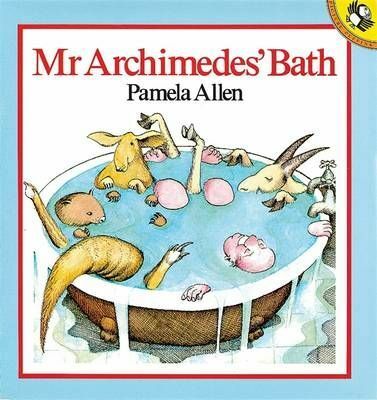 When Mr Archimedes takes a bath with three of his friends, Kangaroo, Wombat and Goat, the water always overflows and makes a mess. Mr Archimedes is determined to find the culprit. Using a measure and taking turns getting out, they finally discover who it is. Early science made fascinating with the use of animal characters, comical text and colorful illustrations.